Over the many years of performing saltwater aquarium installation and maintenance services throughout the state of Connecticut and the New York City area, we have heard many and myths and false information being passed around regarding salt and fresh water aquarium setup and upkeep. With all of the sources of information available these days, it’s easy for the wrong information to be posted somewhere or misinterpreted by the reader and then passed around from hobbyist to hobbyist. Unfortunately, many of these myths have had the negative effect of preventing some people from purchasing and maintaining a saltwater aquarium. In this article, we will attempt to dismantle some of the most popular myths that we have come across and set the record straight. Myth #1: A freshwater aquarium is extremely easier to maintain and is recommended for beginners over a saltwater aquarium. It is true that the typical freshwater aquarium setup and maintenance process can be considered less demanding that the average salt water aquarium, but in most cases they will be equally challenging to setup and maintain. The main difference in the level of work involved will be the process of “mixing” saltwater. It is recommended that you mix up your saltwater using water that’s gone through a reverse osmosis (“RO”) filter, to remove any impurities and start with nice, clean, water. Myth #2: A fish will only grow as large as the aquarium it’s kept in. This is a very popular myth among aquarium hobbyists. In a sense, there is a level of truth to this particular myth, but unfortunately the truth created is for unhealthy reasons. The fish in your aquarium will create an enzyme, which will eventually tell them to stop growing once it has reached a certain level. This trigger, which tells your fish to discontinue their growth, can lead to decreasing health, deformities to occur, and possibly death. If you are not performing consistent water changes within your tank, it will allow the enzyme to build up and cause your fish to stop growth. This is why it is important to perform water changes for your tank. Myth #3: Clownfish are very difficult to keep in captivity. Many people are of the understanding that clownfish are very difficult fish to keep healthy, and are recommended for only experienced aquarium owners. We have found this to be completely not true. Studies have indicated that clownfish are ideal for people who are considered beginner aquarium hobbyists. They are easy to care for and will not require a large tank in order to survive. 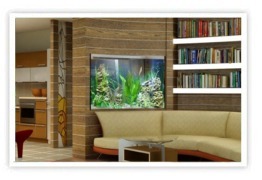 Myth #4: Small aquariums are suggested for beginners and require less maintenance services than large aquariums. Many aquarium hobbyists have learned of this myth the hard way. The margin for error of for a small fish tank is much less than that of a larger tank. The majority of small tanks are heavily overstocked with fish that are in-turn overfed. The over-feeding leads to the rapid accumulation of waste, which will lead to more time spent performing aquarium maintenance services. If you have any questions regarding your fresh or saltwater aquarium setup or maintenance, you can contact the aquarium specialists at Normal Aquatics for a free consultation by calling (203) 292-5922. 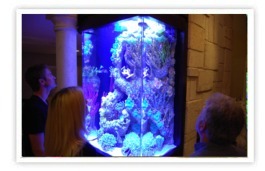 Normal Aquatics is an aquarium design and maintenance company based in Greenwich, Connecticut that has offered installation, maintenance, repair, and design services for aquariums since 1999. Our primary concerns are establishing and maintaining long term client relations while taking a proactive approach to sustaining the health of our marine life. Whether you’re looking for an aquarium in the Connecticut or New York City area, salt water tanks, fish tank cleaning, or fish tank sales near we can assist you. We are confident that our experienced and trust-worthy staff will be able to accommodate your needs.